Here’s how the Miami Dolphins’ travel schedule was impacted by Hurricane Irma, with trips to Los Angeles, London and more. 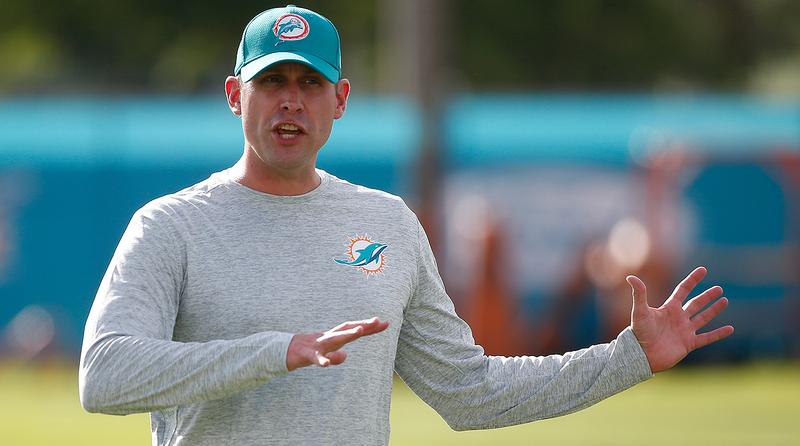 For reasons extending well beyond football, September will be a trying month for Adam Gase and the Dolphins. No one should feel for any football teams from Florida. At all. People should feel for the state of Florida, and for the displaced people, and the ruined property. But this is a football column, and I think you should know what’s going to happen to the Miami Dolphins in the next three weeks. It’s already happening. Competitively, it’s one of the toughest stretches logistically I’ve ever seen for a team that had a slight prayer of challenging New England in the AFC East this season a week ago. Still might have that prayer, judging by the way the Patriots played Thursday night. But a few words about what the Dolphins are about to experience. In short: The Dolphins will spend 13 nights between Sept. 8 and Oct. 1 on the road, flying to stadiums and cities and hotels nine time zones apart. The Patriots will spend one night in the same period on the road in a hotel. (I don’t count teams staying at a hotel the night before home games; it’s too convenient.) The Dolphins will fly for a total of approximately 34 hours and 55 minutes between now and Oct. 1, round trips to Los Angeles and New Jersey and London. The Patriots will fly six hours round trip to New Orleans. • Friday, Sept. 8: Two days after the NFL moves the Bucs-Dolphins game to Week 11 because of Hurricane Irma, about half the Dolphins’ players plus more than 100 staff members and families boarded a charter at 10:30 p.m. in Miami and flew more than five hours to Los Angeles. The travel party bused 75 minutes north to Oxnard, to two hotels in the area where the team will practice beginning Wednesday. • Saturday through Monday, Sept. 9-11: Players off. Those players who left south Florida for the hastily arranged “bye week” last Wednesday are due at the Oxnard hotel by Monday night for a Tuesday team meeting. • Wednesday through Saturday, Sept. 13-16: Practice in Oxnard. Bus to hotel near the Chargers’ home stadium Saturday. • Sunday, Sept. 17: Play the Chargers at StubHub Center. Fly five hours home to Miami. • Monday through Friday, Sept. 18-22: Regular practice week preceding game against the Jets at the Meadowlands. • Saturday, Sept. 23: Fly three hours to Newark. • Sunday, Sept. 24: Play the Jets at MetLife Stadium. Fly three hours home. • Monday through Thursday, Sept. 25-28: Prep to play New Orleans. Fly 8 hours, 35 minutes to London after Thursday’s practice. • Friday and Saturday, Sept. 29-30: Festivities, acclimation, some practice in London. • Sunday, Oct. 1: Play the Saints at Wembley Stadium in London, 4,405 miles from their home in south Florida and 5,437 miles from where this 24-day odyssey began in Los Angeles. Fly 9 hours, 40 minutes home to Fort Lauderdale. Begin to play first home game of 2017 at Hard Rock Stadium … on Oct. 8.